Dirty work clothes, how should I wash out pesticides? The crop was just sprayed. Can I work there today? All pesticides have some level of risk. If you work with pesticides like herbicides, insecticides, or cleaning products containing antimicrobials on a regular basis, your risk is greater because your exposure is greater. Even though some pesticides may not make you sick on a daily basis, long-term (chronic) exposure to certain pesticides may increase your risk of chronic health effects. Therefore, it is important to take steps to reduce your risk by minimizing your exposure to all the pesticides you work with. Always follow the label. The directions on a pesticide label are there to protect you and others from becoming over-exposed. Consider using the least toxic methods of pest control to get the job done. Integrated Pest Management options can be less costly and more effective than traditional chemical control. Personal Protective Equipment (PPE) can be uncomfortable to wear, but it can protect you from being over-exposed. Read the label to find the appropriate PPE or contact your state lead pesticide agency for help. Inspect your PPE to make sure it will do its job effectively. Check for signs of cracking, swelling, stiffness, sponginess, or any change of color in the rubber or plastic of your PPE. 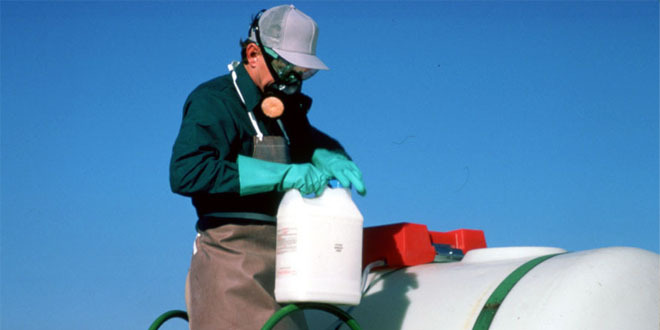 Frequently washing the pesticide off your chemical resistant clothes, like aprons, boots and gloves, can minimize your exposure and help your equipment last longer. Cleaning this kind of PPE at work may reduce your family's exposure. Wear your PPE when you are mixing, loading, or when you are cleaning the equipment. Consider bringing an extra set of clothes to change into at work in case you get pesticides on your clothes. Remove your shoes before entering your house, take a shower immediately and clean work clothes properly to reduce your family's exposure. Remember disinfectants are pesticides, too! Always read and follow the label, even with products you've used before. If you want to discuss a workplace concern, call NPIC or contact your local regulatory agency or OSHA contacts. If you have questions about this, or any pesticide-related topic, please call NPIC at 1-800-858-7378 (8:00am - 12:00pm PST), or email us at npic@ace.orst.edu.